Francis was killed-in-action in Korea on February 10, 1951, earning the Silver Star for his bravery. His brother, Robert, was killed-in-action in Korea on January 10, 1951 and was awarded the Medal of Honor. Francis was killed while serving in the vicinity of Kumwang-ni, Korea, when his Company attacked Hill 442. They were halted by enemy fire, and ignoring a painful wound, he reorganized his platoon and resumed the assault. Inspired by his actions, the platoon charged and it was then that he received his second, and fatal, wound. "To their consciences they were true and had the genius to be men." Second Lieutenant Francis J. McGovern, Infantry, Company I, 9th Infantry Division, is awarded the Silver Star for gallantry in action on 10 February 1951 in the vicinity of Kumwang-ni, Korea. On that date his company jumped off in an attack to seize Hill 442. After advancing approximately 300 yards, the company was halted by intense mortar, automatic weapons and small arms fire. Completely ignoring a wound which he received at this time Lieutenant McGovern, with forceful leadership, reorganized his platoon and resumed the assault. Inspired by his heroic conduct and absolute fearlessness, the platoon followed him in a fierce charge upon the hostile positions. During this attack, he was wounded a second time. The gallantry and inspirational leadership displayed by Lieutenant McGovern reflect great credit upon him and the military service. "As I look at the caskets of two young men who lie before this alter in the sleep of death, I am reminded of a lesson that was written deep in their hearts. He who loves God is a Christian; he who loves his country is a patriot. But he can be neither, who is wanting in the spirit of sacrifice." 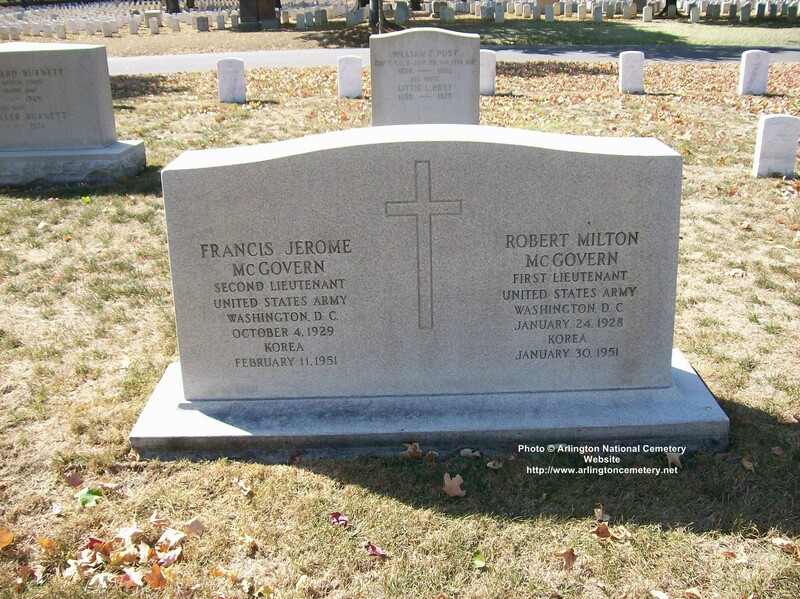 "In translating these words into action on the field of battle in far-off Korea, Robert and Jerome McGovern gave a magnificent exemplification of the lesson which they learned in the classrooms of St. Gabriel's School and St. John's College. Of whom do we think, if not of them, when we hear the words as spoken by Christ--greater love than this no man hath, that a man lay down his life for his friends." On a cold winter morning a half-century ago, Halsey McGovern sat down at his typewriter in Northwest Washington to begin one of the most heartbreaking tasks a father could face. A telegram had arrived three days earlier--on February 12, 1951--to say McGovern's son Bob had died leading a valiant charge in combat in Korea. Now his father set out to break that news to his son Jerome, who was in Korea with another Army division. "Only those of us here in the family fully realize how badly this news will sadden you, Jerome," the 65-year-old traffic consultant typed. " . . . I am sure that you will act like the fine man you are. . . . May God bless you and protect you, is the sincerest wish of your old Dad." As his father wrote those words, Jerome already was dead--struck down while rallying his platoon as it rushed up a desolate hill in the face of withering enemy fire. The letter came back to the McGoverns' Petworth home stamped "missing in action." Bob received the Medal of Honor; Jerome was awarded the Silver Star. Halsey McGovern--embittered by the national indifference to the Korean War--refused to accept either medal. Fifty years after it began, the Korean conflict is a largely forgotten war, overshadowed by the enormity of two world wars and more recent hostilities in Vietnam and the Persian Gulf. Just seven years after servicemen came home as heroes from European and Pacific battlefields, Korean War veterans returned to face an ambivalence that many Americans felt about an undeclared enemy that never had threatened their shores and a conflict that ended in truce, not triumph. Those national misgivings were to resurface more than a dozen years later as U.S. troops were drawn into Vietnam. This Memorial Day, as the 50th anniversary of the war's onset nears, Korean War veterans will be remembered in a ceremony at Arlington National Cemetery. Next month, the anniversary of June 25, 1950, when the North Korean army swarmed across the border into South Korea, will be marked with major ceremonies in Washington and Seoul. For the families of the nearly 37,000 Americans who died in Korea, the memory of that war needs no renewal. Halsey McGovern buried his boys side by side at Arlington and made front-page news across the nation when he rejected the honors awarded them. "He didn't think they had the full support of the country," said Charlie McGovern, younger brother to Bob and Jerome, now a 67-year-old retiree who lives in Columbia. "You don't send a bunch of kids off to a war and not support them." As boys, Bob and Jerome played soldier with broomsticks in the alley by their New Hampshire Avenue home. They graduated from St. John's College High School in the District, where the yearbook predicted that easygoing, soft-spoken Jerome would go far and described Bob as "the brain . . . always ready to argue or discourse on anything Shakespearian." Both brothers joined the Army after graduation. Bob McGovern was stationed in Japan as part of the U.S. occupation army. Jerome arrived after hostilities broke out in Korea, as Japan became a staging area for what President Harry S. Truman called a "police action" against the North Korean invaders. In September 1950, the McGoverns parachuted into Kimpo Airfield in Korea with the 187th Airborne Regiment. They were part of the Army's sweep north through Korea, a push so successful that U.S. commanders predicted a quick end to the war. But a month later, as Gen. Douglas MacArthur drove the flagging North Korean army hard against the Chinese border, the communist ranks were stiffened by Chinese troops. In November, the Chinese soldiers took charge, launching an offensive that staggered U.S. forces and started what MacArthur called "an entirely new war." As American forces reeled in retreat, they suffered such heavy losses among officers that the McGovern brothers were sent to new units to fill the gaps. A bitter winter--with sub-zero temperatures and relentless snow--had taken hold of the countryside by the time the United States and its United Nations allies mustered the strength to counterattack on Jan. 25. The troops moved forward through the rolling terrain, capturing one ridge line after another from an entrenched enemy. "It was an unbearable cold, and we weren't too well equipped," recalled William Rawlings Jr., a rifleman in the platoon of 23-year-old Lt. Bob McGovern. McGovern's unit--A Company, 5th Cavalry Regiment, 1st Cavalry Division--was picked as one of those to lead a reconnaissance in force. "The Chinese had broken contact with us and it was our job to go out and find them and see how badly they wanted to fight," his company commander, Richard Wolf, wrote later in a letter to Halsey McGovern. They found them on Jan. 29, about 20 miles southeast of Seoul and five miles from Kumyangjang-ni, dug in and waiting atop a hill designated 312. "Charlie" Company was ordered to dislodge the Chinese troops and took heavy casualties in a fruitless daylong assault. "As we sat at the base of the hill sweating it out, every last man in my company knew that if Charlie failed we would have to try the next day," Wolf wrote. A and B companies got the call the following morning, advancing under the protection of a dense fog as they moved up the steep, rocky hill. McGovern's platoon climbed for three hours and was within 75 yards of the top when the fog suddenly lifted. Chinese soldiers hidden in trenches and foxholes opened up with heavy small-arms fire and showered grenades on the advancing troops. McGovern picked up several grenades and hurled them back. "He was encouraging us, 'Come on, let's get them,' " recalled Alexander Sykes, a rifleman. "He was leading from the front. He wasn't in the back saying, 'You guys get them.' "
Although the attack bogged down under enemy fire and McGovern was wounded, he kept moving. "He went ahead of everybody, bless his heart," said Wynne Hunt, a rifleman. "He said, 'Follow me,' and away he went." McGovern charged a machine gun emplacement that was raking his platoon. Ten yards from the position, a burst of gunfire tore his rifle from his arms. He kept going, firing his pistol and throwing grenades. "Bob McGovern went up ahead and he saw where most of the enemy was, and he threw himself into the trench and wiped them out," Hunt said. It was his final act, and it carried the day. His body lay lifeless in front of the enemy position, and Hunt helped other soldiers carry their lieutenant down Hill 312. The offensive raged on across a frozen landscape that favored the entrenched Chinese troops with an escape from the biting wind--if not genuine warmth. 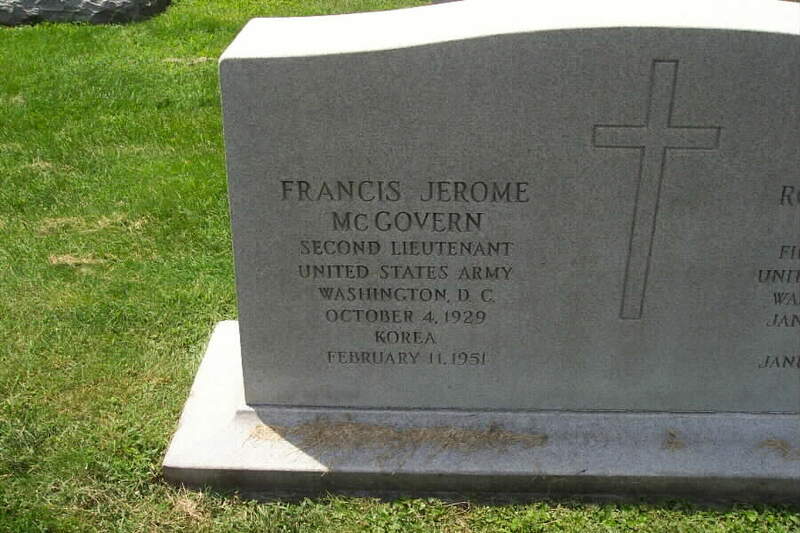 About 15 miles from the hill where his brother had died, Jerome McGovern's unit--the 9th Infantry Regiment, 2nd Infantry Division--had been losing men by the score. 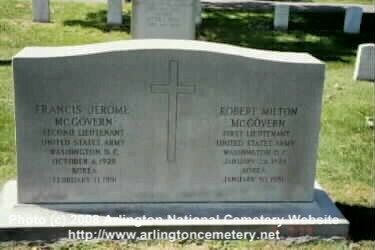 "They were getting knocked off so fast," recalled Joseph Lovetro, a rifleman in Jerome McGovern's company. "It was a slaughterhouse. You didn't want to know the name of your buddy because he wouldn't be alive the next day." The bodies of some American soldiers who had been captured were found beheaded or dismembered by the Chinese, he said. "There would be nothing left of them," Lovetro said. "They were merciless." By Feb. 10, unaware of his brother's death, McGovern and his unit had advanced about 15 miles farther into enemy-held territory. That night, his company attacked Chinese soldiers dug in on Hill 442 near Kumwang-ni. They advanced 300 yards before being halted by a blaze of mortar and machine-gun fire. 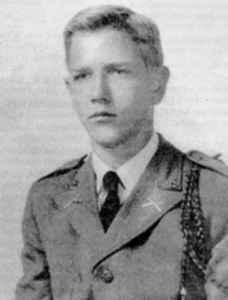 McGovern was wounded, but the second lieutenant managed to rally his platoon and resume the assault. McGovern reached the hill crest first and urged his men on, but just as he called to them, he was hit again and fell dead. The Silver Star citation said that his men, "inspired by his . . . absolute fearlessness," swept the enemy from Hill 442. In the swift current of warfare, Jerome McGovern's body lay overlooked and abandoned. Word that Jerome was missing in action reached Washington on March 3. "Here, while all of us, young and old, are still numbed and stunned by our loss of Bob, we get the shocking and disturbing news that Jerome is missing in action over there," Halsey McGovern wrote to relatives. He waited in anguish for months, hoping that Jerome had been taken prisoner. When news of his death came in June, Halsey McGovern called it "crushing, unbearable." "The impact of it was terrific," recalled Elizabeth Gough, younger sister to Bob and Jerome. "It was rough on everybody." The brothers' funeral in November, presided over by the auxiliary bishop of the Baltimore-Washington Roman Catholic Archdiocese, was attended by hundreds, including the St. John's cadet corps and almost the entire Petworth community. Afterward, accompanied by a military honor guard, they followed the two flag-draped coffins across the Potomac River to Arlington for burial. "They went out to Korea together, they came home together, and now, after a double funeral, they lie side-by-side in rest--which is the way I believe they would have liked it, had they known that things were to turn out as they have," Halsey McGovern wrote in a letter a few days later. 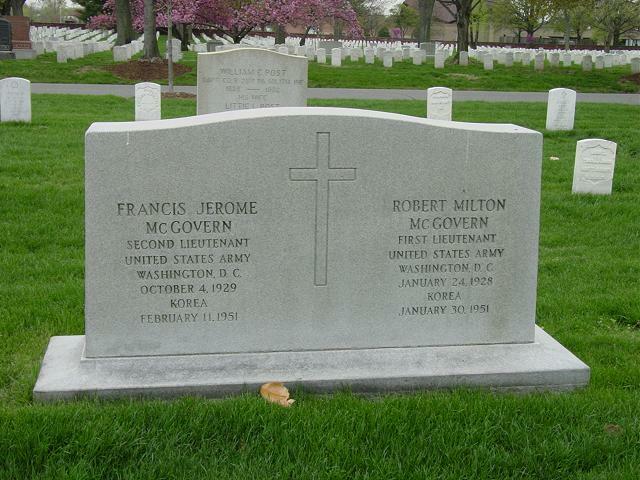 The story of the McGovern brothers brought the war home to Washington, but it exploded into national controversy two months after the funeral, when the Army nominated Bob McGovern for the Medal of Honor. Truman's failure to put an all-out war effort behind U.S. soldiers in Korea "sears the soul of an understanding father," McGovern wrote in a letter to the Army, turning down the Medal of Honor, as well as the Silver Star awarded to Jerome. "I don't think Truman is worthy to confer honors on my boys, or anyone's boys," he told reporters. Several members of Congress offered to present the medals, but McGovern turned them down, saying the matter was closed. Although he lived to be 97, he never wavered on that point. In a letter to relatives, he acknowledged that the citation that accompanied Bob's medal "will make you proud of him and of all the American kids who die and have died over there." In 1990, seven years after Halsey McGovern's death, the surviving McGovern siblings asked the Army to issue the medals, and they were presented to St. John's. The school is planning a new display for the medals and intends to commemorate the 50th anniversary of the McGoverns' death, a spokesman said. On a frozen battleground in North Korea nearly a half-century ago, 1st Lt. Bob McGovern led his Army platoon on an assault up a rocky slope against enemy troops who were pouring machine gun and mortar fire on U.S. troops from hillside bunkers. Two months earlier, the Chinese Red Army had launched its devastating Yalu River offensive, but now, in late January 1951, American and allied forces had regrouped and were returning the attack. McGovern, a Washington native and a 1946 graduate of St. John's College High School in the District, was hit and wounded as he and his platoon from the 5th Cavalry Regiment came under withering machine gun fire. But McGovern continued up Hill 312, and he urged his men on. When he was within 10 yards of a machine gun nest, a burst of fire ripped the carbine from his hands, but he continued forward, firing his pistol and throwing grenades. The machine gun was silenced, but McGovern fell in front of the bunker and died. He was 23. For his valor, he was awarded the Medal of Honor. Eleven days later, Bob McGovern's younger brother, 2nd Lt. Jerome McGovern, St. John's Class of 1948, was fighting nearby in Korea, but he had not learned of his brother's fate. Leading his platoon on an attack to seize a hill near Kumwang-ni, Jerome McGovern was wounded, but he reorganized his platoon and resumed the assault. The platoon followed him on a fierce charge, and the lieutenant was hit a second time; this time his wounds were fatal. He was 21. For his gallantry, he was awarded the Silver Star. 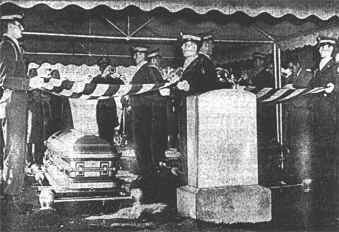 The funeral of the McGovern brothers was a major event in Washington. Friends and neighbors from the Petworth neighborhood where the boys had grown up turned out in force, as did the cadets of St. John's. Bishop John McNamara presided over the service, and the brothers were buried at Arlington National Cemetery. 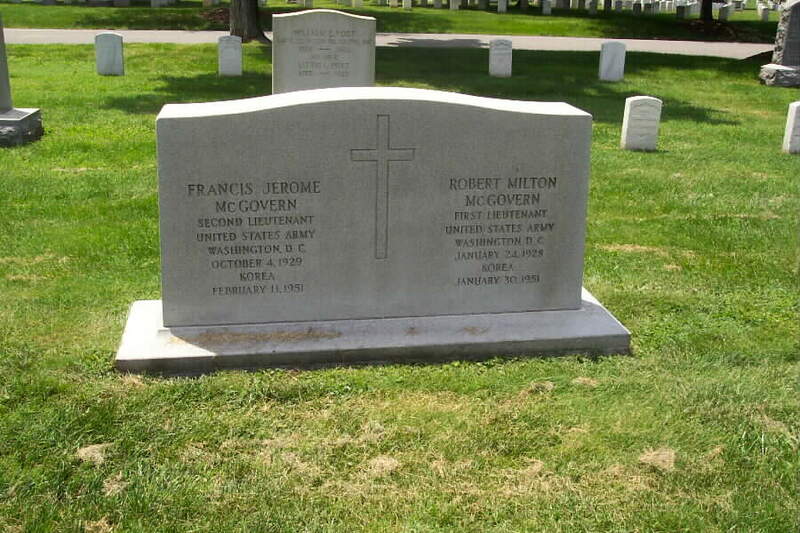 "Close in Life, the 2 McGovern Boys Are Buried Side by Side," The Washington Post reported. Now the memory of the McGovern brothers and their sacrifice has been rekindled on a former battleground in another part of the world -- Bosnia. More than a year ago, Charlie McGovern, 66, a retired Montgomery County Parks Department employee living in Columbia, and his brother, John McGovern, 74, a retired engineer living in Wheaton, read a news story about U.S. troops in Bosnia who were based at a place called Camp McGovern. The two wondered if there could be any connection with their two long-dead brothers, Bob and Jerry. John McGovern wrote to the Department of the Army in February, and Charlie McGovern followed with several e-mail inquiries, but they received no response. Finally, in May, they contacted the office of Rep. Benjamin L. Cardin (D-Md. ), who wrote the Army on their behalf. The Army soon sent Cardin's office a letter confirming that Camp McGovern is named for the "Congressional Medal of Honor recipient, Robert M. 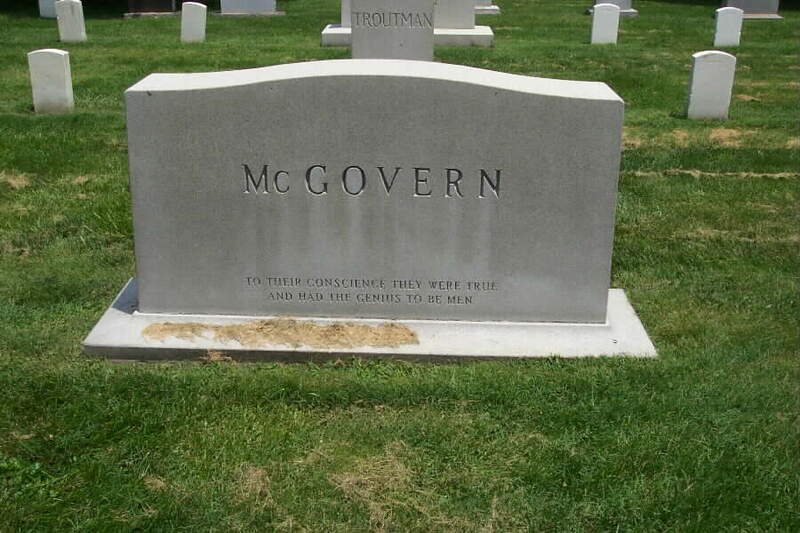 McGovern." "It was kind of ironic that they never said anything to us," Charlie McGovern said. It was a nice surprise, he and his brother are quick to add. "So much of history is soon forgotten," said John McGovern, a World War II veteran who served on a B-24 bomber with the Army Air Forces in the Pacific. The McGovern brothers have never been forgotten at St. John's. "You can stop any student in the hallway and ask them about the McGovern brothers, and they'll tell you," said Brother Edward Adams, head of the alumni office for the school in Northwest Washington. "We're very proud of those young men. They are very much a part of the history of the school." The school's rifle team still bears the name McGovern Rifles Drill Team. The brothers' citations and medals were on display in a hallway for years, and they will be put in a school museum now being planned, Adams said. 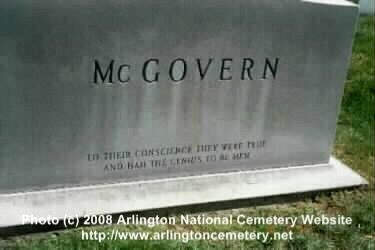 But learning that the McGovern name also is remembered by U.S. soldiers an ocean away has been a source of pride for the family. "I am sure I speak for the family when I say that we are pleased that Bob and Jerome are still remembered, almost 50 years later, for their bravery and heroic actions in Korea," Charlie McGovern said. The camp was established by one of the units that led the U.S. force into Bosnia in late 1995 -- the 5th Cavalry Regiment. In coming up with a name for the camp, the 5th Cavalry decided to honor one of their own: Bob McGovern. Located south of the city of Brcko along the narrowest portion of the Posavina Corridor, the camp is critical for keeping Bosnian Serbs and Muslims at peace. Charlie McGovern began an e-mail correspondence with Capt. Elizabeth Hibner, the public affairs officer for the U.S. task force now at Camp McGovern. He sent a package of material about Bob and Jerome, which was distributed to commanders at the base. "Our base camp proudly displays a new sign at its entrance explaining the history and heroism of Lt. McGovern," Hibner said. "We're keeping the history alive." Charlie McGovern learned that soldiers at the camp had donated much-needed school supplies to children living nearby. Before going to Korea, Bob McGovern had been stationed in 1949 at Camp Crawford on Hakkaido Island in Japan, where he learned of the difficulties faced by a local group of Franciscan missionary nuns trying to care for an army of young children orphaned by World War II. Bob McGovern wrote to friends back in Washington, describing the plight of the children and asking them to help out. In subsequent years, there was a steady stream of clothing, medicine and food sent to the orphanage. In that spirit, Charlie McGovern has organized a campaign to have friends and family members send material for the soldiers at Camp McGovern to distribute. "We have received numerous boxes of school supplies as a result of Mr. McGovern's efforts," Hibner said. "We have received everything from backpacks to pens and pencils and small articles of clothing. I have been personally overwhelmed by people's generosity." Helping children is a fitting way to remember his brothers, Charlie McGovern said. "You keep thinking, 'How many children would they have now?' " he said.